For more information about Riverpoint Academy, visit riverpointacademy.org. Mead’s newest high school is miles away from Mt. Spokane and Mead both in environment and educational styles. Riverpoint Academy opened its doors this fall in the Innovate Washington building, on the banks of the Spokane River near downtown. The academy is a collaboration of the Mead School District and Riverpoint Campus colleges and universities. Its focus is producing critical thinkers by promoting STEM literacy (science, technology, engineering and mathematics) and nurturing the creative passion within each student. The school has been two years in the making. “It’s been an incredible journey,” said Dan Butler, Mead deputy superintendent. Nothing about the academy is conventional. On a recent morning, students in Sarah Pooler’s Bio MCT – medical, chemistry and technology – class perched on tall stools at industrial-looking metal tables, computers ready. Pooler’s classroom has a concrete floor and open-beamed ceiling. Old industrial garment racks have been converted into whiteboards on wheels. They do double duty as room dividers and nest neatly when not in use. Teens worked quietly in groups, but one thing was noticeably missing: textbooks. “Students have options and choices in how they study. They can use online resources and we have access to WSU libraries and printed materials. What they are studying is current right now – not published five years ago,” Pooler said. The enrollment is open only to juniors this year, but next year the school will have juniors and seniors. Students can use private or public transportation to get to the downtown campus, or they can catch a school bus at Mead or Mt. Spokane high schools. Kris Cook, 17, explained the project he’d been working on: putting new products into old advertisements. 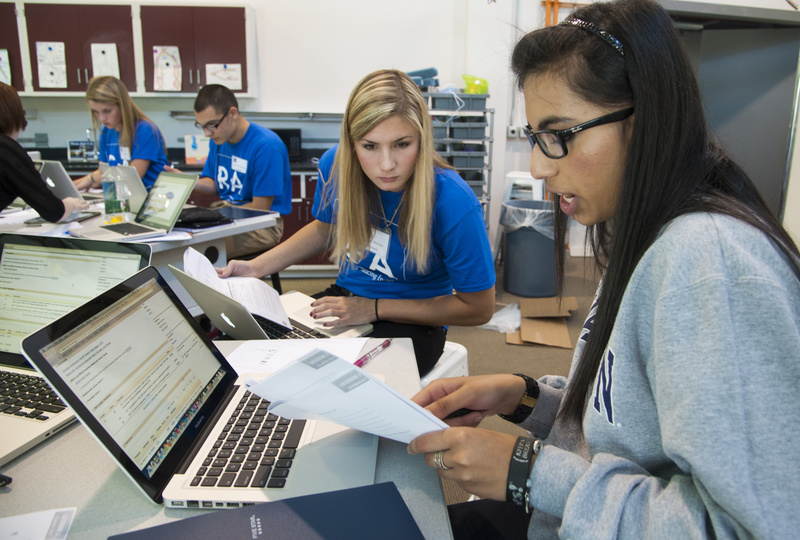 This real-world approach to business and leadership is integral to the academy’s mission of enabling students to think critically and use a variety of resources to gather information. To facilitate that goal, Riverpoint Academy has partnered with Greater Spokane Incorporated to get a mentor for each student from employers in the community. Another vital component of the school is encouraging students to produce work that matters in the community. Students work on a design challenge such as how to make downtown Spokane more welcoming to seniors. At the end of the year they’ll present their findings and ideas to the community. “We want our kids to be creative problem solvers,” Butler said. As part of its partnership with the Riverpoint Campus, math classes will be taught by EWU faculty, and college-level language classes will be offered during the last quarter of the year. That’s just what district officials had hoped.